My eyes are small and with the use of white eyeconic kajol they look bigger. Generally I use white eyeconic kajol to draw my waterline. I extend the white kajol a little out of the inner corner and tear duct area and slightly smudged it. 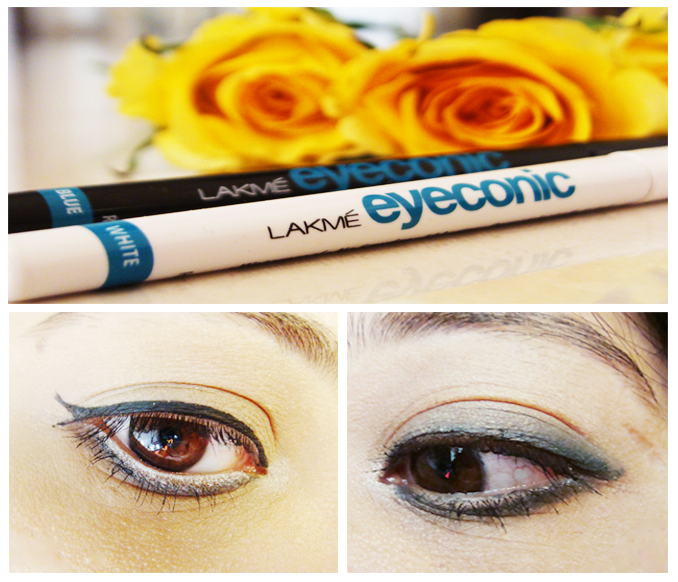 To give a little contrast on my eyes, I use black kajol in the lower lash line and bland it. I normally use black eyeliner on the upper lash line. Finally I curl my lashes and apply mascara on the upper and lower lashes. Then my eyes look quite bigger. This trick could be very helpful for girls with small eyes like me. My current favourite beauty trend is Smokey eye makeup. Here the blue eyeconic works a good job. I love this shade of blue! You girls can use the blue kajal as a base and then put other blue shadow. Here I first applied blue kajal all over the eyelid and blended all over the crease line. Fill the waterline with the same blue color and some on the lower lash line and smudged it. I use very little white kajal out of the inner corner. To finish off, I curled my lashes and added mascara. So, My eyes will look big and gorgeous anytime. A simple trick but could be very useful. If you have any other trick then share with me. I really want to learn some very easy and simple eye makeup technique.